Sunday Parkways, July 27th, in Khunamokwst Park. The place teemed with people from young to old in all shapes and sizes. Andando en Bicicletas en Cully (ABC) had the corner on the new park’s southwest corner, featuring their Photovoice Project, which calls for safe streets in Cully. They also offered bike quick fixes, provided helmets and free fittings, and led an afternoon group ride. 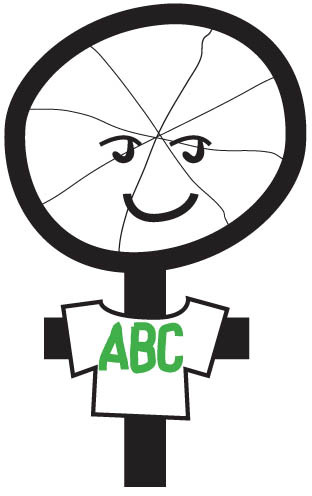 ABC formed in 2010 as a partnership between the Community Cycling Center and Hacienda CDC. The group promotes healthy, active living with bikes. They do this through hosting bike rides, advocating for safe bicycle storage and infrastructure, and providing basic bicycle maintenance and training to friends and neighbors. For the Photovoice Project, ABC collaborated with For Every Kid, a coalition of over 40 organizations working to make safe routes to school for every kid in the metro-area. The Photovoice Project extends work the neighborhood has been doing for several years to remove barriers that prevent their kids from being active. 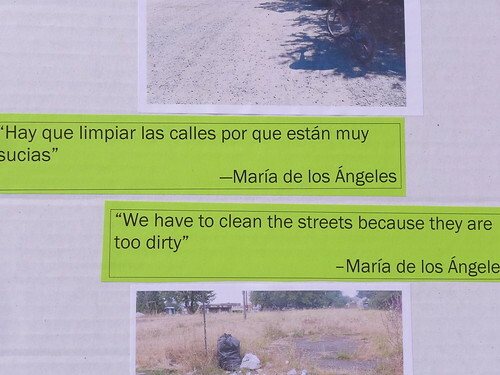 “Este proyecto es importante para que arreglen los caminos y sea mas segura para la familia andar en bicycleta y caminar,” said Wendy Yah Canul of ABC. As Yah Canul identified, fixing roads and making it safer for families to bike and walk supports a healthy childhood. In Cully, 36% of streets are considered sub-standard and unsafe compared to 19% of streets citywide. Teresa applied neon pink brightness to brakes and wheel bolts during the bike quick fixes. She seemed to touch every bike in need, confident in her ability to fix a flat and eager to learn techniques for tightening brake cables. Two women in white shirts with green ABC lettering, Veila and Marlene, joined Community Cycling Center’s Lale Santelices in front of a TV camera for an interview. Veila and Marlene spoke about the infrastructure needs and improvements in Cully depicted in the Photovoice Project. With animated gestures, Lale translated for these spokeswomen. Later on, fellow ABC member Wendy joined Lale and spoke with another TV station about the project. After the interview, Veila and Marlene fitted a number of youth with helmets. They demonstrated where a helmet should rest on the kids’ foreheads and made Vs with their fingers to show how the helmet straps should fit around their ears. Last, they helped the youth snug the chinstraps. The lively day for ABC at Khunamokwst Park went one further with a group ride along the Sunday Parkways route. Trailers, two-wheelers, and more rolled out of the park in response to Maria’s call, “¡Vamos!” A young girl pedaling proudly and confidently on her bike with training wheels fell in love with a person in a tree costume waving to all the Parkways passersby. She joined in her own version, twisting around on her seat and waving “Bye-bye, Árbol” well past the end of the block where Árbol could no longer hear. 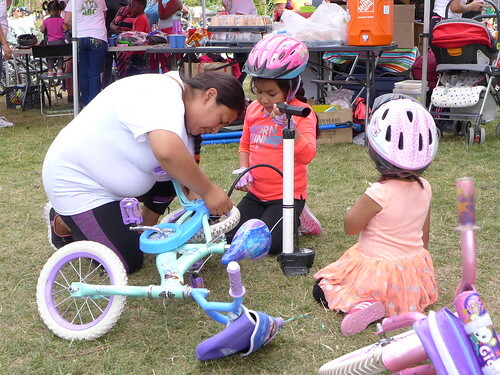 From the new Khunamokwst Park and Sunday Parkways, to the helmets and the Photovoice Project, this Sunday showcased the hard work of numerous organizations. 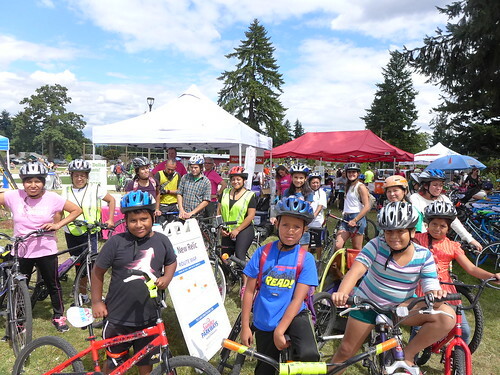 In addition to Leeanne Fergason from the For Every Kid Coalition, a hearty thank you to our funders, Central Northeast Neighbors, Inc. for supporting ABC’s Bike Fair at Sunday Parkways and to Voices for Healthy Kids for funding the Photovoice Project. 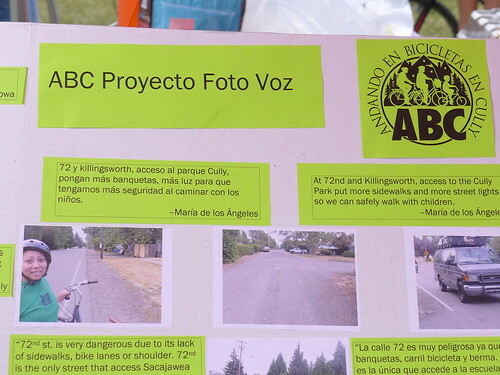 To learn more about the Photovoice Project or to get involved in activities that remove barriers to biking and walking, contact Lale Santelices at the Community Cycling Center.